Aesthetics Secret Weapon. Microdermabrasion Paired with nutrients and oxygen for plumping is Powerful. We want you to experience the power of microdermabrasion. It’s one of the most powerful resources in skincare when ‘paired’ with deep penetrating serums and nutrients. The perfect time to plump, rejuvenate and feed your skin is immediately is after your microderm treatment, when the skin’s surface layer has been freshly removed allowing for extraordinary nutrient penetration. Here’s our 2 favorite ways of taking advantage of the ‘perfect microderm moment’. 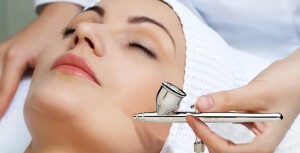 After your microdermabrasion you’re primed for a serum-plumping oxygen treatment. Great for a weekend of looking fabulous while nourishing your skin. This robust facial starts right after your microderm. This ‘powers’ the effects of the facial. An incredibly effective way to treat blemishes and fine lines. Call today and ask for your favorite Aesthetician. Wesley, Marina, Lilly and Alisha – all California Certifed Aestheticians and CoolSculpting Certified Technicians!